If the main topic of conversation you have with your friends is not how you can better yourself, you need to get new friends. Bravo, xkcd. Another point well-made on a concept that scales really well. Consider: If you were to bill yourself for the time spent researching and making purchases, how would the final cost influence your purchasing decisions? Would it change how you spend your time? Would it change how your spent your money? These questions hinge on two deeper, more revealing questions: how do you value your time, and where are you most willing to spend it? 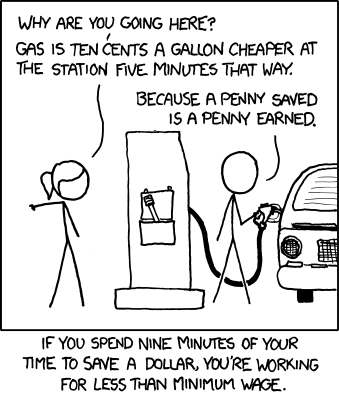 The comic above makes an excellent point: you probably aren’t willing to work for less than minimum-wage just to save a few dollars on gas. Conversely, there is an interesting question implicit in this point: What do you value enough that you would work for less than minimum wage? Odds are that you’re already doing just that. The problem with the Internet startup craze isn’t that too many people are starting companies; it’s that too many people aren’t sticking with it. The manual is a catalog of the product’s flaws.